As you probably already know, on this blog we are currently showing you our selection of lighted Easter decorations. 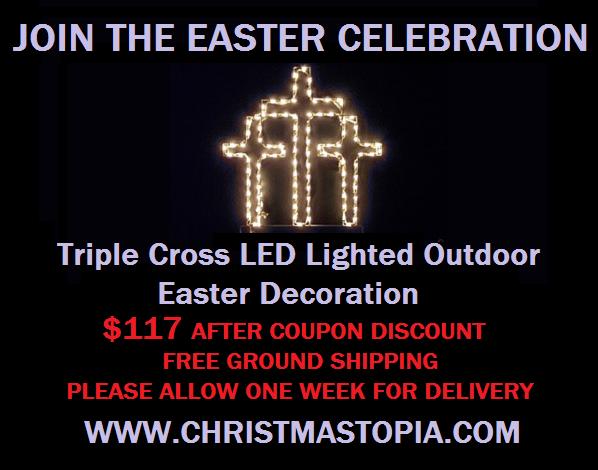 A splendid selection that includes this beautiful lighted cross for Easter. Pre-installed LED string lighting adorn the powder coated gloss white steel frame of this symbolic lighted decoration. This decoration can be used absolutely anywhere you want. It’s not heavy so hanging the decoration is not a problem. 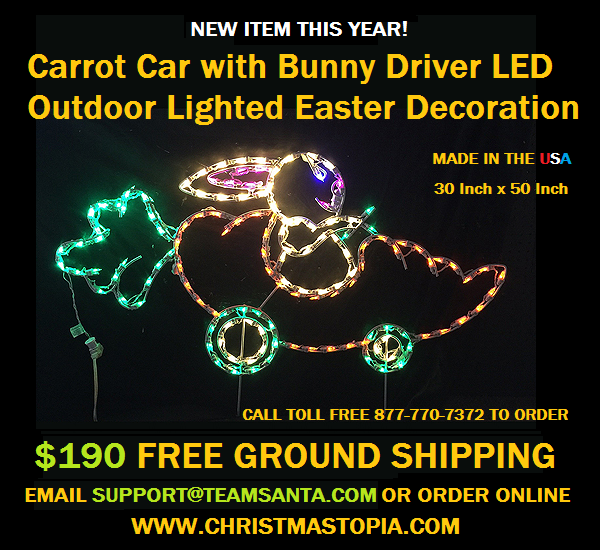 The lighted Easter Decoration can be used with our complete selection of outdoor Easter Decorations. This specific decoration measures 36 inches by 25 inches, so it’s somewhat sizable. It weighs approximately 3-5 pounds so it’s easy to hang inside or outside. The LED lights are all pre-installed. All the bulbs are pointed in the same direction, so when you use the cross at night, the LED bulbs emit a beautiful array of visual energy generate through the soft white light. This lighted cross has warm white LED string lights pre-installed and they give off a super nice soft white glow. If you would like a different color, just indicate that in the notes section of the shopping cart or tell us at support@teamsanta.com and we we’ll do our best to help you change the color. 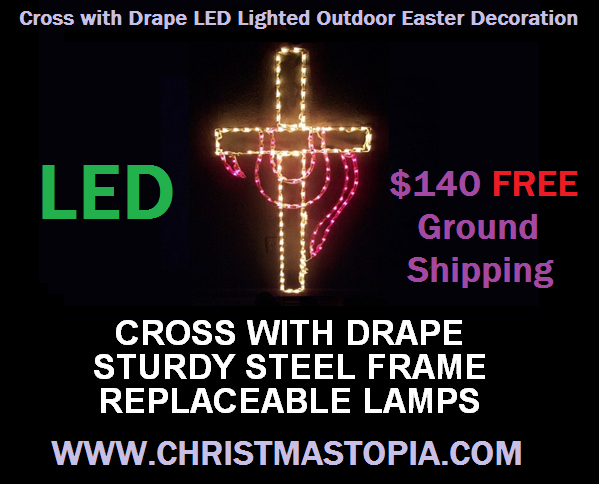 This lighted cross is quite popular and we do sell a bunch. You can be assured that you are getting a high quality product that’s made in the USA. 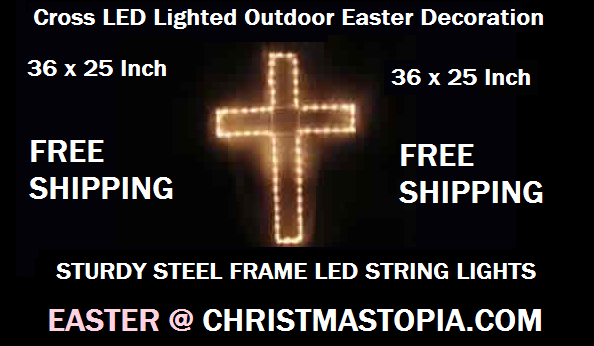 Go ahead and show the world that you have pride in your faith and purchase a lighted cross and hang it during the Easter season. Until next time.. Welcome back to Team Santa Inc. E News. We are currently in the process of introducing our delightful selection of indoor outdoor lighted Easter Decorations Today we have the coolest little decoration. Allow me to introduce the LED lighted Easter Egg. 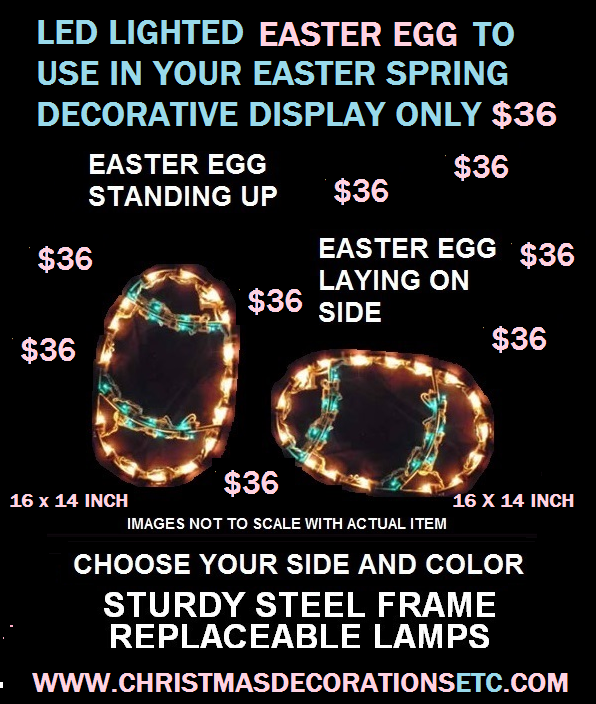 You can have the Easter Egg in any color you want, providing we have the color string lights. 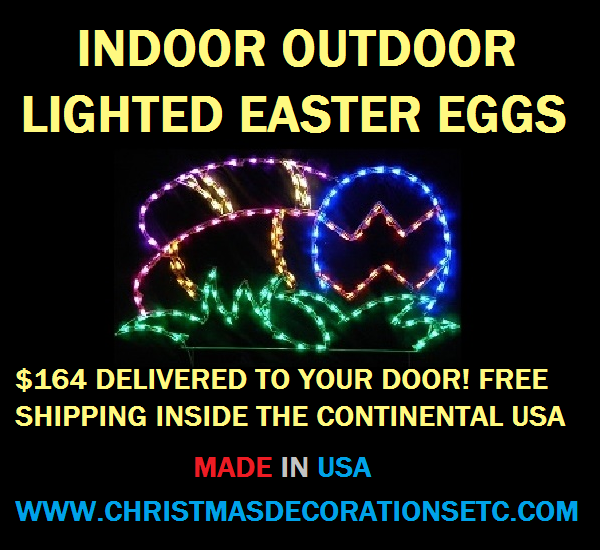 The lighted Easter Eggs are ideal to stick in the lawn or garden outside your home or business. They look great in traditional gardens among the different plants. Also ideal, is the fact that they are only 16 inches tall which makes them perfect for hanging them in your window, door, railing, deck. 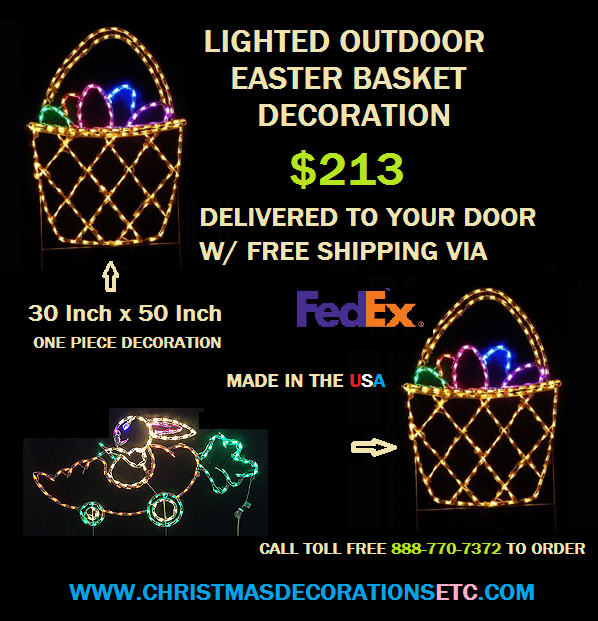 The lighted Easter Egg has LED string lights pre-installed on the decoration with your choice of color lights. The Eggs are lightweight, so there is no concern related to whether the Egg is too heavy to hang or not. This specific lighted Easter Egg weighs approximately 2 lbs, so the Egg will hang with an ordinary suction cup. Each one of our lighted Easter Eggs is made proudly right here in the USA. They are all made of powder coated steel, with each frame painted a gloss white. The clips and the string lights are also white, so the decoration looks good in the day as it does at night. The LED light bulbs last a LONG time. However, if you do encounter a burned out bulb, we do include spare bulbs with the product so just replace the bad bulb with a good bulb and you’ll be all set. 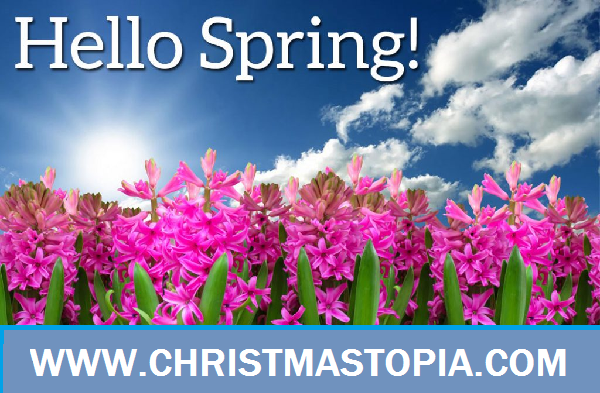 Plus if you need bulbs in the years to come, just email us and we will send them to you. Make sure the. 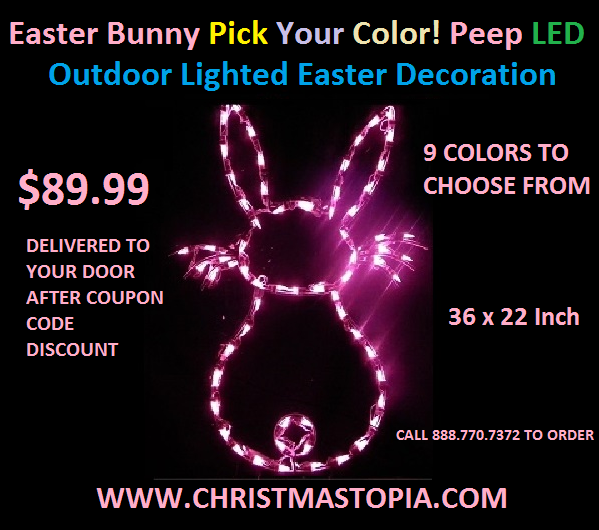 Easter Bunny is able to find your house on Easter Sunday with a one or several of these lighted Easter Eggs. Mix and match colors is an awesome idea for any Easter Decorations display. Until next time..